Depending from the application and the label material, cab provides the three ribbon qualities wax, resin-wax and resin. cab ribbons have a special back coating to better dissipate residual heat, avoid static electrification and friction. This improves the quality of the imprint and extends the lifecycle of the print head. 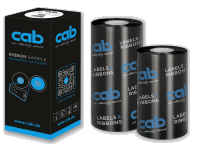 cab provides more than 20 types of ribbon for any application. Adapted specifically to cab printers, these ribbons offer a consistent high quality. make flexible in case of universal printing on smooth paper or plastics. The density is as good as with pure wax ribbons, however, they are more resistant to smear and scratching. for highly resoluted printing with print speeds up to 250 mm/s. Fully smear- and scratch-proof. UL listed. For further features see resin ribbons above of this page. Dimmensions and more information you find here: Product brochure. Features correspond with those of the black ribbons.